One peaceful night, Koto (female protagonist) accidentally crashes down into the “mirror capital” named Kyoto while chasing a magical black rabbit. In this weird city that models itself after the old medieval Kyoto, Koto discovers her three long-lost siblings that have been trapped in the city for a long time, waiting for their parents to come back. Follow Koto as she tries to mend broken family ties and reunite the family once more, all the while getting into all sorts of trouble. A fitting description of Kyousougiga would be that it pleases the eye as much as it pleases the heart. Initially, you’ll be drawn in by fantastical world reminiscent of a Japanese version of Alice in Wonderland. The stunning and almost otherworldly sceneries and other eye-catching visuals give the show a certain charm unique to its own. You’ll then be drawn in a second time by the heartwarming story of the love and rebirth of a family, in which each family member undergoes some sort of maturation and self-discovery. 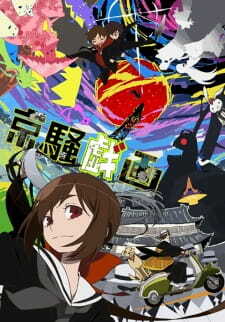 Now, it is a surprise that Kyousougiga managed to air 10 episodes. Considering the premise of the show and the fact that the five ONAs released (yes, there were ONAs) beforehand were rather random and perplexing, Kyousougiga was definitely at risk. There are some parts of Kyousougiga where the animation, felt like a literal copy and paste from the ONA episodes into its episodes. There is more dialogue than action rather which is a bummer. In addition, the dialogue is rather lengthy and drawn out, slowing down the pacing overcomplicating the story and making it rather boring at times. Kyousougiga does make an attempt to make up for its flaws. In the case with Kyousougiga, the dialogue towards the end actually helps explain and make sense of everything. Sure, it may take a few times of re-watching to understand fully, but once understood, viewers will realize that Kyousougiga wraps its complex story up. As for the animation, I understood the budget situation so I didn’t mind it at all. To sum up this Anime in a few sentences, I do think that this Anime is worth the watch. Despite it only being 10 episodes (long shorter than what you typically see nowadays), it does a great job of telling the story, I think the studio wanted it to be portrayed. While doing so in a reasonable fashion.